Liver X receptors (LXRs) belong to the nuclear receptor superfamily of ligand-dependent transcription factors. LXRs are activated by oxysterols, metabolites of cholesterol, and therefore act as intracellular sensors of this lipid. There are two LXR genes (α and β) that display distinct tissue/cell expression profiles. LXRs interact with regulatory sequences in target genes as heterodimers with retinoid X receptor. Such direct targets of LXR actions include important genes implicated in the control of lipid homeostasis, particularly reverse cholesterol transport. In addition, LXRs attenuate the transcription of genes associated with the inflammatory response indirectly by transrepression. In this review, we describe recent evidence that both highlights the key roles of LXRs in atherosclerosis and inflammation and provides novel insights into the mechanisms underlying their actions. 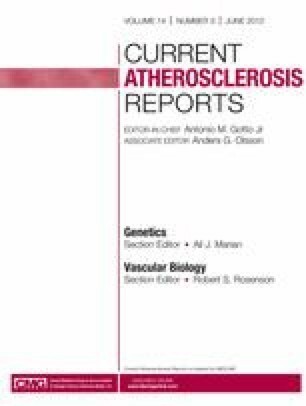 In addition, we discuss the major limitations of LXRs as therapeutic targets for the treatment of atherosclerosis and how these are being addressed. We thank the British Heart Foundation for financial support (Grants PG/05/096, PG/08/073/25520 and PG/10/55/28467). D.R. Michael has his salary paid for by British Heart Foundation grant PG/10/55/28467. T.G. Ashlin: none. M.L. Buckley: none. D.P. Ramji received British Heart Foundation project grants that included salaries for staff and expenses for consumables for research carried out on various aspects of atherosclerosis in the laboratory, including the LXRs. These are acknowledged in the Acknowledgment section. There was no direct payment for the submitted work and no one gains from this. • Giannarelli C, Cimmino G, Connolly TM, et al. Synergistic effect of liver X receptor activation and simvastatin on plaque regression and stabilization: an magnetic resonance imaging study in a model of advanced atherosclerosis. Eur Heart J. 2011;33:264–73. doi: 10.1093/eurheartj/ehr136. This study demonstrates the potential of combination therapy (LXR agonist and statins in this case) in the treatment of atherosclerosis.